This recipe uses fresh fennel leaves, which are rarely sold but often grown. If you have no access to fennel, use fresh dill instead, it will still taste delicious. Place the egg yolks and lemon juice in a food processor. Whizz until they turn pale, then add the fennel or dill. Turn the machine back on and slowly pour in a thin stream of olive oil, followed by sunflower oil until you have a thick mayonnaise. Season to taste and transfer to a serving bowl. Preheat a ribbed grill pan over a medium-high heat. If you own two, preheat both, as it will speed up the cooking time. 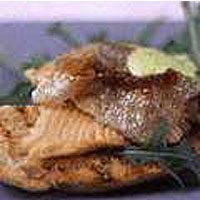 Rub the trout with olive oil and season, then grill the fish for 8 minutes on each side until they are cooked. Serve hot, warm or cold, depending on your mood, with the fennel mayonnaise.